SACRAMENTO, Calif. (AP) Donovan Mitchell had another big game and added to his growing list of spectacular dunks with a one-handed jam in the third quarter. Still, coach Quin Snyder had a little critique for the rookie. Mitchell’s defense could still use some work, says Snyder. 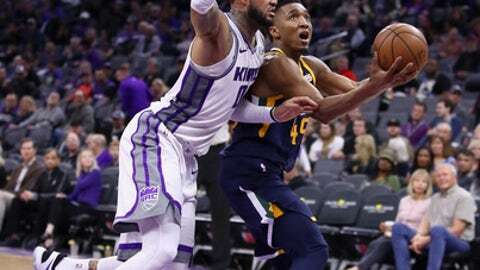 Not that it mattered much for Utah on Wednesday night, when Mitchell scored 23 of his 34 points in the second half to lift the Jazz over the Sacramento Kings 120-105. Utah’s outstanding rookie split a pair of defenders at the arc, then drove in for a dazzling, uncontested dunk. Mitchell scored the next six points for Utah, and Hood added six straight to make it 85-67. Mitchell said the dunk had extra meaning for him. Mitchell is getting a lot of push to be in this year’s dunk contest during the All-Star break, but the rookie isn’t sure if he’ll be part of the festivities in Los Angeles. Jazz: Mitchell has scored 30 or more in five games this season. … Favors had 10 of Utah’s 17 rebounds in the first half, including all five offensive rebounds. … Thabo Sefolosha sat out his second consecutive game with a sprained right knee. Kings: De’Aaron Fox fouled out late in the fourth quarter. He had six points and four assists. … Vince Coleman and Garrett Temple were both held out as part of coach Dave Joerger’s new plan to rest two veterans each game. Sacramento also played without Skal Labissiere (left shoulder strain).